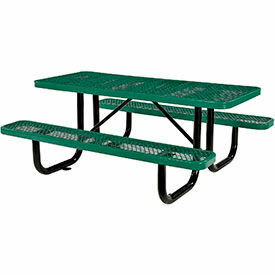 Steel Surface/Portable Mount Picnic Tables Are Used For Parks, Public Buildings And Other Outdoor Areas. Steel Surface/Portable Mount Picnic Tables are made of high gauge metal for long lasting durability in outdoor weather conditions. Steel legs and supports add additional stability and outdoor tolerance. Thermoplastic finish offers excellent protection against corrosion and wear and tear. Some outdoor picnic benches feature up to a 2" opening to accept umbrellas. Available in Rectangular, Square, Octagon, Oval and Round. Measurements vary per model. Assembly is easy. Multiple colors available.